This week there was much excitement in school as we welcomed a very special visitor. Julia, a nutritionist from Thomas Franks, came to talk to us about healthy foods. She told us about the many different food groups and why they are so important to our diet. 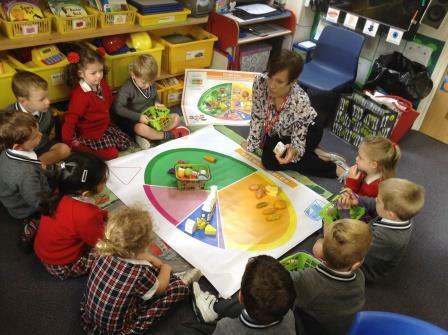 With this knowledge, the children visited our ‘Classroom Supermarkets’ to select foods and discover how they keep us healthy. The children had so much fun, rushing about with their baskets and even got the chance to try some unusual fruits such as dragon fruit, papaya, star fruit, pomegranate and many more. What a fun day!